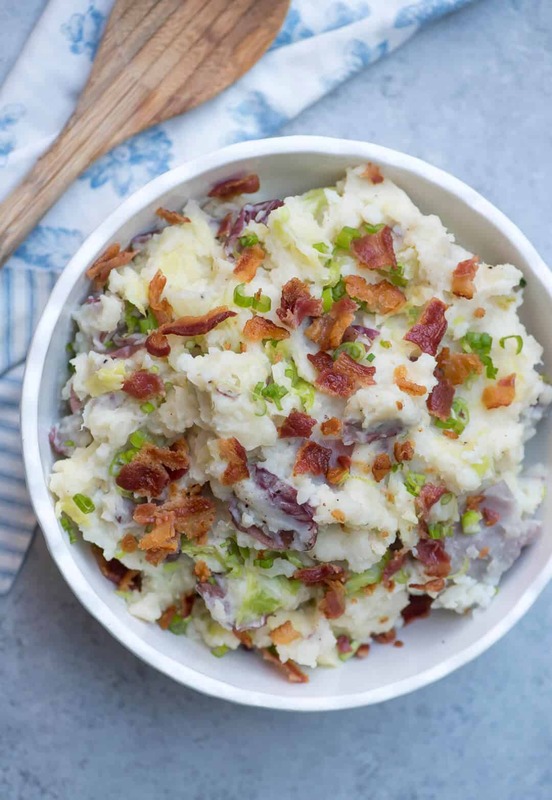 In my version of classic Irish Colcannon Potatoes I’ve combined creamy red-skinned potatoes with sautéed sweet green cabbage, and tossed in some smoky crumbled bacon and a sprinkling of green onion. This dish is far too delicious to save for St. Patrick’s Day! 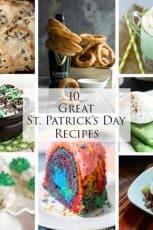 Do you cook a special meal for St. Patrick’s Day? I love holidays that involve cooking and really, just food in general, so this whole special meal deal is right up my alley. 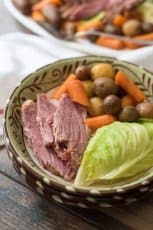 I’ve always done corned beef and cabbage with carrots and potatoes in some form or another … every… single… year. 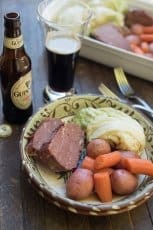 I rotate between the simply wonderful Slow Cooker Corned Beef and Cabbage and my highly flavorful stovetop version of Guinness Corned Beef (love!). 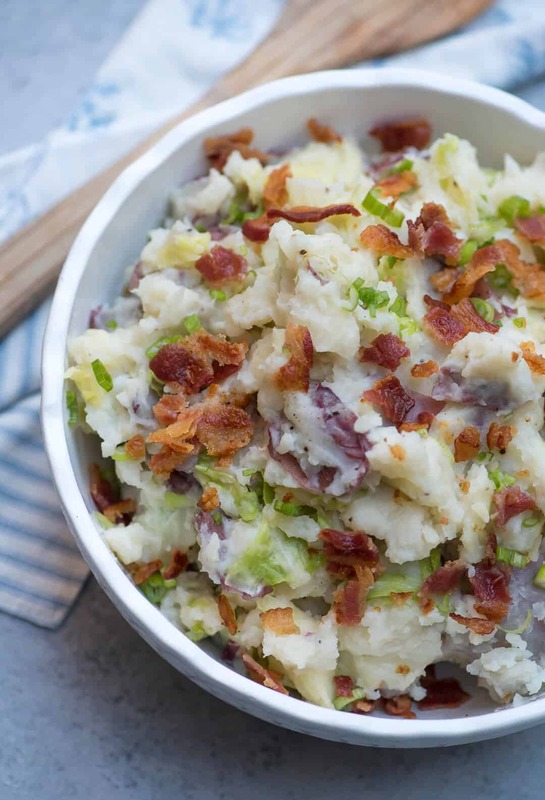 But, last year I departed from my routine just a bit and decided to give these Irish Colcannon Potatoes a try to serve along with my corned beef and holy smokes-good-gosh-almighty, my friends…. I am 100% in love with this delicious dish. It’s super easy too. Always a bonus. I used red-skinned potatoes and purposely left the peel on to add some vibrance and texture to the dish. Just quarter them and boil them up until they are fork tender. While they drain you’ll sauté some chopped green cabbage and minced garlic in melted butter for just a few minutes. Then the whole shebang is combined with some warmed milk, a little butter, some simple seasonings and garnished with crumbled bacon and green onion. We made a quick little video to show you how it’s done so scroll down and check it out. So easy! I really hope you try it. 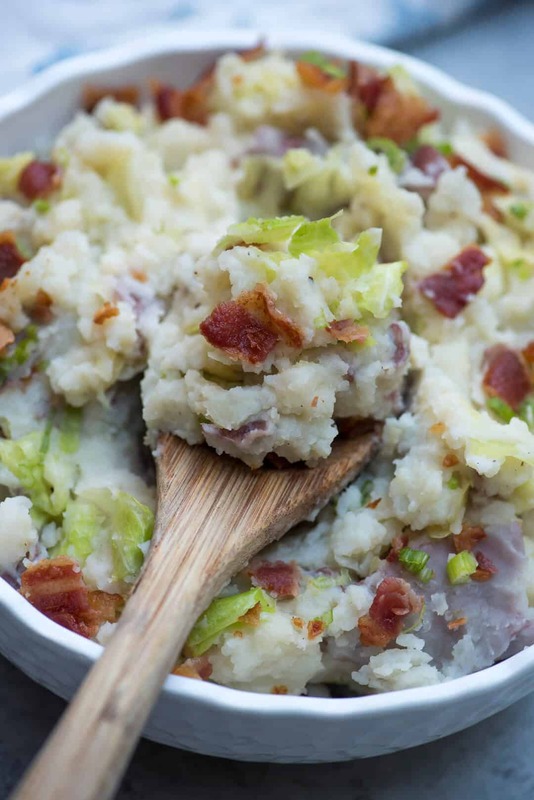 I am a Colcannon Potatoes convert and I’m certain this dish will be on my St. Patrick’s Day menu and many others going forward. We had two batches of this glorious dish on hand this week as I wrote this recipe and filmed our video and I served it one night with cast iron steaks and roasted asparagus. Flat out fabulous and the leftovers reheated beautifully. 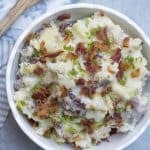 In my version of classic Irish Colcannon Potatoes I've combined creamy red-skinned potatoes with sautéed sweet green cabbage, and tossed in some smoky crumbled bacon and a sprinkling of green onion. This dish is far too delicious to save for St. Patrick's Day! Add potatoes to a large pot or Dutch oven and cover with cool water by about 1" Add 2 teaspoons salt, cover, and turn heat to HIGH. Watch closely and when water reaches a boil, reduce heat to MEDIUM and cook at a low boil for 15 to 20 minutes, or until potatoes are tender when pierced with a sharp knife, but not falling apart. Remove from heat and drain well. Transfer potatoes to a bowl and set aside. Add 2 tablespoons butter to dry pot, place over MEDIUM heat and when melted add garlic. Saute until fragrant and add chopped cabbage. Cook, stirring, for about 5 minutes, or until softened. Season with 1/2 teaspoon salt and 1/2 teaspoon pepper. Remove from heat. Add cooked potatoes back to the pot with the cabbage. Add about half of the milk, onion powder, remaining 1/2 teaspoon salt and remaining 4 tablespoons butter. Use a potato masher to smash the potatoes to a slightly chunky consistency (they should not be completely smooth), adding additional milk as needed. Taste and season with additional salt and pepper, as desired. Crumble the cooked bacon and sprinkle over the potatoes. Garnish with green onion. To cleanly and easily cook your bacon place it on a foil-lined rimmed baking sheet and bake it at 400 degrees F for about 15 minutes or until it reaches the desired crispness. Remove from oven and transfer cooked bacon to paper towels to drain. Blot grease with additional paper towels. I used 2% reduced fat milk with an excellent result. If you want a richer dish, use whole milk, half and half, or heavy cream. This is gorgeous. Is Colcannon a variety of potato? Thanks, Mimi 🙂 No, it isn’t a variety of potato. It’s the term used to describe the traditional Irish dish of mashed potatoes with cabbage or kale. You could use any variety of potato you prefer but I really like it with red-skinned potatoes. I hope you try it, Amy! We really love them! This dish looks absolutely delicious. I can’t wait to try it. How would you do this as a make ahead dish to take to someone’s house and what would be the best way to reheat it? Hi Julianne. A big YES to the make-ahead idea. I’ve reheated these potatoes with great success. If you feel they’ve thickened too much, just stir in a touch more milk before you reheat them in the microwave. I didn’t even need to add any milk and they were wonderful. How do I reheat these if made ahead? I did mine in the microwave. Hi Valerie, These look divine! I know you’ve had a couple of questions about reheating these and I was wondering if you made them with the bacon and everything on them and THEN reheated it. I wanted to make them on the weekend and then store in the fridge to take to work on Monday, Do they reheat well from being fridge-cold? How long did you reheat them for in the microwave? Thanks! Hi Anne. I reheated our leftovers so the dish was completely assembled. If I was making them in advance, I’d most likely garnish them with bacon and green onion after reheating. I can’t recall exactly how long I let them go in the microwave but just set it for a minute or two, give them a stir, and go from there. How many does this receipe serve? I’d say about 10, Sandra. Made this to accompany corned beef for our St. Patty’s day dinner. Absolutely delicious side dish. I added a little bit of apple cider vinegar for some extra zing. Loved this and will definitely make it again! Made this last weekend with my Mom. We absolutely loved it! One thing to note, do not over cook the cabbage. Keeping a little crunch is a nice foil to the creamy/chunky potatoes. This is going to be a regular side dish for our family from now on. Re-heats well IF there are left overs. 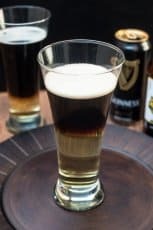 Made it for St. Patrick’s Day and everyone loved it. I made patties out of the leftovers (not too much left! ), and fried them with leftover corned beef slices and eggs for breakfast the next day. Yumm. do you cook the cabbage first? Just to let u know that I made this dish in a dutch oven and it was yummy! Thanks for your helpful video.